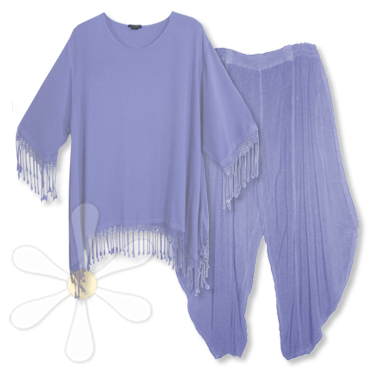 We've matched our bestselling fringed tunic with our most popular harem pants in our lovely lavender we call Samar. These are the Marrakech -- a style I've customized for goddesses whether willowy or rubenesque! To see more photos and details, including measurements, for the Marrakech style, click here; for the FEZZAH tunic, click here. These pieces sell separately for $186. Express who you are every day... why not?